There was no “royal taster” to make certain his food was not poisoned. 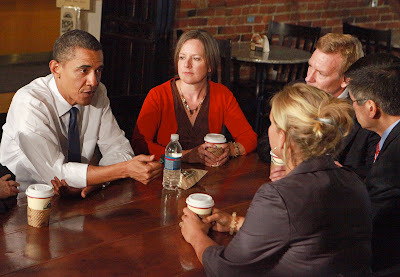 But there was some confusion as to what — if anything — President Barack Obama would eat when he sat down with a group of small-business owners Tuesday at Grand Central Bakery in Pioneer Square. Instead, His Royal Slenderness went whole hog with half a turkey sandwich and a spinach salad, and ordered a jam-filled biscuit for the road. While it’s no secret that Secret Service agents were on hand to keep a close eye on the proceedings, the food-prep “was all in real-time,” insists Allen-White, who sat at the president’s elbow as he ate during their lunch-time chat. When word came down Saturday about the president’s upcoming visit, Pioneer Square cafe manager Sarah Lucey was skeptical at first, figuring the White House herald sent to break the (hush-hush) news in person would soon crack a grin and say, “Smile! You’re on Candid Camera!” But when he insisted he was the real deal, she asked him for his credentials, said Allen-White, before calling the corporate office. On Tuesday, Lucey was one of the nervous few on hand during the presidential visit. It was Lucey who stood behind the counter as cranberry chutney was slathered on Como bread for Obama’s turkey sandwich, allowing that indeed the president could use his political clout and eat local — with a special “side”-portion of Grand Central’s Skagit Valley Salad a toss of Willie Greens baby spinach, Skagit Sun strawberries, Gothberg Farm’s goat’s milk feta cheese and Walla Walla sweet onions with strawberry-balsamic vinaigrette. For which he paid in cash, pulling a $20 bill from his wallet and leaving a token of his appreciation in the tip jar and his signature on a receipt (“We’re going to frame it,” said Allen-White).